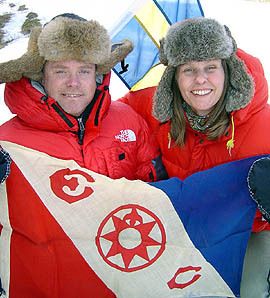 The Explorers Club, New York, have honoured the Expedition by awarding it the right to carry the prestigious flag. The same flag have been carried by great explorers such as Sir Edmund Hillary, Robert Peary, Richard Leakey and Robert Ballard. No Swedish Expedition have ever had this honour before. The only other Scandinavian who have carried the Flag is the world renowned Norwegian Thor Heyerdahl, who carried it when excavating Pyramids de Guimar on the island of Teneriffa 1998. The Expedition is supported by the Russian Ambassador in Sweden, and the Swedish Ambassador in Russia. From the Russian side the Adventure Club of Dmitry Shparo has taken responsibility to organise and maintain the expedition. The Expedition is carried out under support the Yakutiya Airlines.